Pedigree for the Joey x Dixie Breeding on K9Database. Temperament: confident and very social, loves people, good with other animals. Energy level is "drive on demand", i.e., an excellent house dog but loves to work, especially if her nose is involved. Dixie is very stylish and animated in all she does. She has turned heads and earned compliments from judges and spectators alike in every venue she has participated in--first tracking, then field, and now in obedience. Temperament: bomb-proof - has travelled extensively competing with the Super Dogs show throughout Canada and adapts instantly to new situations; great with people and other animals, including other intact males. He is a complete gentleman around the house or out and about, but is fast and flashy when working. 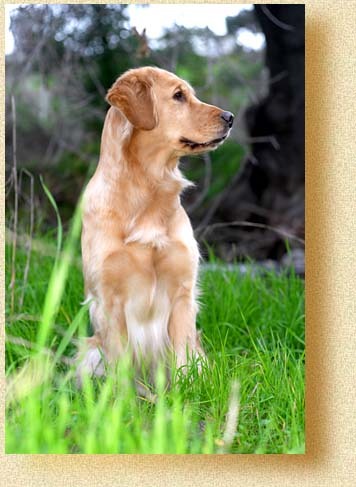 The Dixie/Joey litter continues the Coppertop tradition of striving for excellence, diversity, and soundness by maintaining a well-rounded pedigree including superior examples of conformation, performance, and field Goldens. 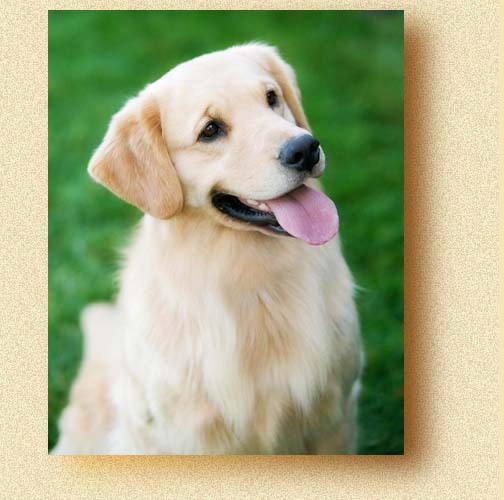 The pedigree for this litter is rich with potential, and we can hardly wait to see the results. Dixie is the product of many generations of Outstanding Dams and Sires, GRCA Hall of Fame dogs, and champions from 3 categories - obedience, bench, and field. Her mother is an OTCH/OBHF dog (among other things) with a long list of accomplishments to her credit, and her father is a 5th generation Qualified All Age dog who also sports an MH. Both Cricket and Trey are products of carefully combined Show and Field pedigrees and have passed on their good looks and considerable talents to their daughter. Dixie herself is a lovely and accomplished girl whose enthusiasm and joy make it a real treat to be her partner. At the time of this breeding she had 40 High in Trials, 27 High Combineds, and 6 perfect 200's - 3 from Novice and 3 from Open. While waiting to find out if Dixie was indeed pregnant, Terry competed with her in the 2007 AKC National Obedience Invitational held in Long Beach, CA, the first weekend in December. This was the first time either Terry or Dixie had competed in this type of venue and it was grueling but fun. Terry was prepared to pull Dixie at the first sign of stress from Dixie but our little social butterfly took it all in stride and enjoyed it immensely. We're very proud to say Dixie did a great job and came home with 4th place in the Sporting Group - with babies on board! Joey is a impressive young male whose pedigree is an interesting blend of Canadian and American conformation lines and contains dogs who are Outstanding Producers on both sides of the border, plus bench champions who are titled in performance venues as well. When we first saw Joey he was performing with the prestigious Super Dogs team at the Calgary Stampede before an audience of hundreds of people in a large indoor stadium. After first watching him fly effortlessly over a series of intimidatingly high jumps we then got to meet him in person at intermission when the audience was allowed to flood around the dogs, petting and visiting with them. Completely unfazed by being suddenly crowded with wall-to-wall reaching hands, Joey simply rolled around on his back wagging his tail and soliciting belly rubs. We love Joey's athletic good looks, his sound health and impeccable temperament, as well as by the fact that he reminds us so much of Dixie - this is truly a "type to type" breeding. 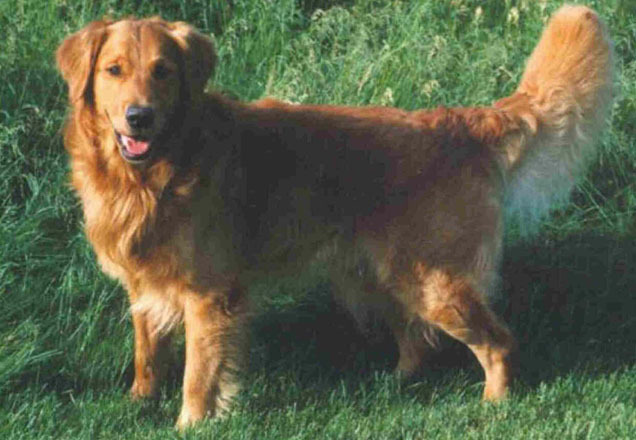 Our goal with this pedigree combination is to produce moderate, attractive dogs with plenty of drive, intelligence, trainability, and stamina; in short, well-rounded and beautiful Golden Retrievers. We expect these puppies to have outstanding potential for obedience, agility, hunting, and tracking. This litter was not planned with the specific goal of producing breed ring or field trial prospects, although we do believe a breed ring prospect could easily be a possibility from the Dixie/Joey combination. We feel the breed ring and field trial areas each have such highly specific (and totally dissimilar) criteria that we do not encourage you to get a puppy from us if your main interest lies in either of these areas. 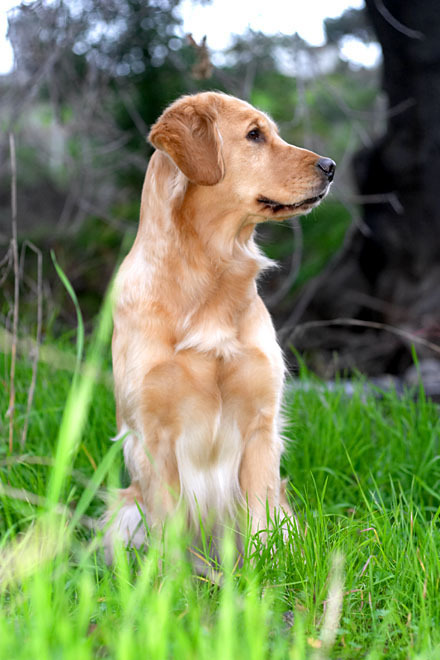 However, if what you want is a wonderful working dog who is a pleasure to look at and to live with, this pairing should produce exceptional results. - Click the above image and then click the play button at the bottom of the page that loads. Chiropractic Visit at almost 4 weeks. The pups got to go up to visit Dr. Margaret Holiday up in Oakland right around 4 weeks. Dr. Holiday adjusted Spirit's litter last year and I posted info about adjusting puppies at an early age here if you are interested in reading about it. Click the picture above to see pictures from this visit.